Want to see more Howell condos? 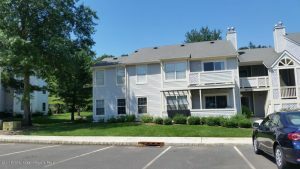 Call 732-598-7700 to see a condo for sale Point O Woods Howell. Point O Woods Howell is a community consisting of 545 condos and townhouses. 170 single family detached homes are also in this community. It is located in Howell, west of Route 9 and south of the Freehold Township border. The condos and townhouse were built in 1988, the single family homes were added in 1991. Condos in Point O Woods Howell will range in price from the mid $100,000’s to the upper $200,000’s for the condos and townhouses. And single family homes will usually sell between the mid $200,000’s to around $400,000. The single family homes pay a small yearly association fee, which goes towards the common area maintenance and use of the amenities, which would be the pool, clubhouse, tennis courts and playgrounds. While in the condos and townhouses, the maintenance fee includes exterior maintenance of the buildings and use of the amenities. In addition, landscaping, snow removal, garbage and recycling collection are supplied. Additionally, pets are not allowed in this community. FHA financing is available. With FHA financing, qualified buyers can purchase a home with as little as 3.5% of the purchase price as a cash down payment. However, this approval expires July 2020. Commuters who live in Point O Woods like it here because bus service to New York and along Route 9 is within walking distance. If you live in Point O Woods Howell, your children will attend the Griebling Elementary School, Memorial Middle School, and the Freehold Regional High School District. When students enter high school, they can apply to attend one of the magnet schools in the Freehold Regional High School District. Each of the six high schools offers different specialized course studies, such as computer science, performing and fine arts, law enforcement and public service among others. As another option, when students enter high school they may also apply to one of the five high schools in the Monmouth County Vocational School District. Specialized courses are available in fields such as computer science, marine biology and communications. Also courses in the medical and science fields are available, among others. Also, private schools are in the area.